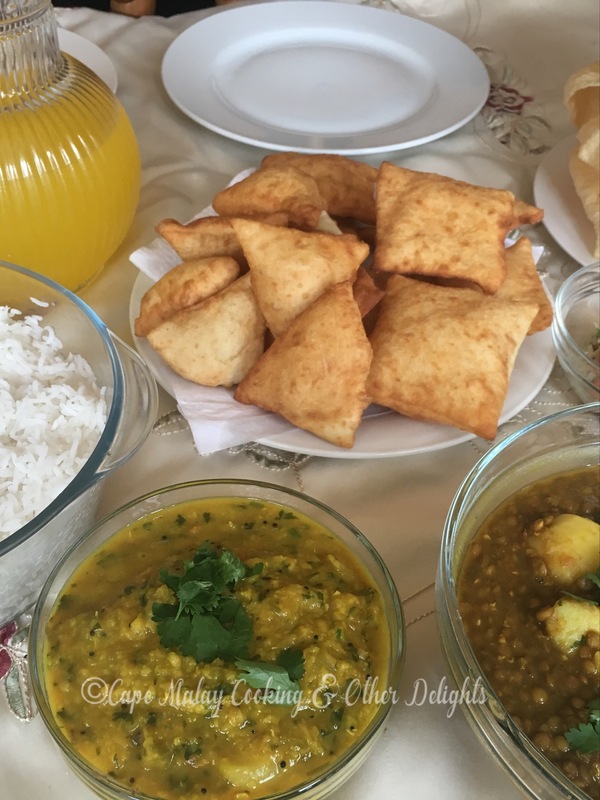 Meatless Monday, here's my recipes for brown lentil curry, dhal curry and puris. Enjoy Salwaa Smith - Cape Malay Cooking & Other Delights From My Kitchen To Yours - keeping our heritage alive! [caption width="640" id="attachment_43070" align="aligncenter"] Dhal, Lentil Curry , Puris[/caption] Brown Lentil Curry Boil 1 cup brown lentils for approximately 30 minutes or until semi soft. Pour it into a colander and rinse thoroughly. In the mean time braise an onion in a tablespoon of oil until golden brown. Add 1 tsp crushed garlic and 1 tsp crushed ginger. Add a chopped tomato and 1 tsp tomato paste as well 1-2 chillies finely chopped (chillies are optional) Add to onion mixture 3 cardamoms 1 piece stick cinnamon 1 tsp salt 1 tsp turmeric / borrie 1 tsp coriander / koljana 1 tsp cumin / jeera 1/2 - 1 crushed chilies 2 tsp leaf masala / roasted masala Cook the spice mixture for about 15 minutes, adding water as necessary. Then add the boiled and rinsed lentils. Cook a further 10 minutes. #capemalaycooking Add 2 large peeled and quarter potatoes and cook for further 15 minutes on slow heat until the potatoes are soft. Stir in a handful of chopped Dhunya. Salwaa's Tarka Dhal Curry 2 cups of dhal washed and drain Cook until soft with 1tsp each garlic, ginger, salt and turmeric approximately 30 minutes Add water as needed Braise one large onion in a separate pan Add 2-3 chillies Add 1/2 tsp mustard seeds Add one large tomato cut in small pieces to onion mixture. When dhal is soft and ready stir onion mixture into dhal and garnish generously with dhanya You may add a tbsp of butter as well. Salwaa's Puris (quick and easy) Ingredients: 2 cups self-raising flour or for each cup of normal flour use 1 tsp of baking powder to make your own self-raising flour ½ teaspoon salt 1 teaspoon sugar Enough buttermilk to make soft, roll able dough or ( take one cup of milk add 1 tbs of vinegar or lemon juice ) to make your own buttermilk Oil for deep frying #capemalaycooking Mix all the ingredients together in a mixing bowl. Knead dough for a few minutes until dough no longer sticks to your hands or surface. Leave dough to rest for a few minutes. Roll out very thinly, cut into circles, rectangles, any shape that takes your fancy!! Fry in hot oil until puri puffs up, 2 minutes, turn and fry the other side. @capemalaycooking EnjoyServe with boiled white rice, rotis, puris. 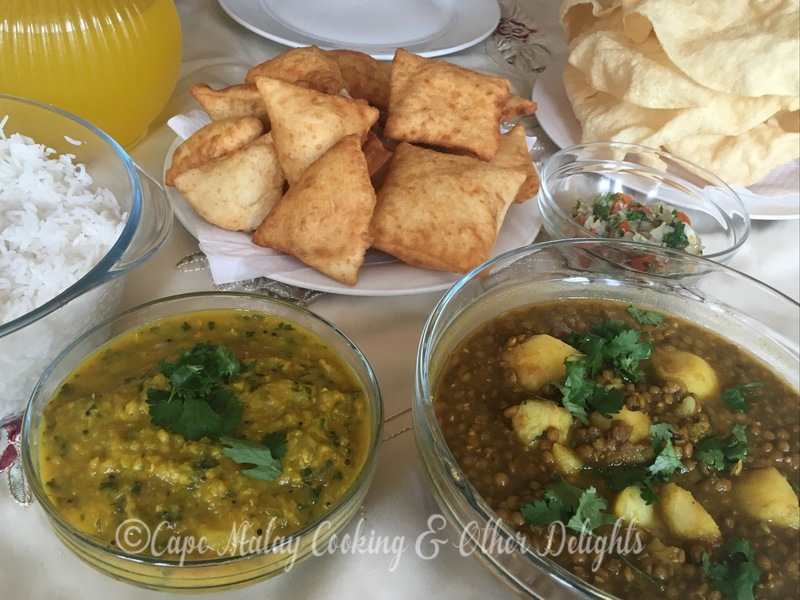 [caption width="360" id="attachment_43071" align="aligncenter"] Dhal Curry [/caption] © Cape Malay Cooking & Other Delights.